Another Performance Imminent: Tuesday 11 May 7:00 p.m.
More info at Book Culture. This samizdat clip provided by writer and publicist Erienne Rojas. 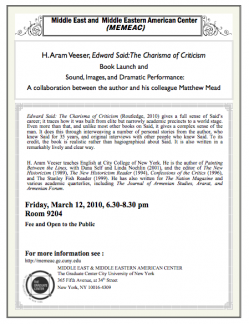 Reading at Alwan for the Arts 19 May 7 p.m.
Alwan for the Arts, the always percolating crossroads of middle-east cultures, has scheduled a multimedia performance around Edward Said: The Charisma of Criticism. Digital wizard Matthew Mead pumps in the creative juice, and H. Aram Veeser supplies the gravitas. The downtown vibe of Alwan matches the Mead and Veeser brand of cultural craziness. Images, theater, and sound clips all serve to illustrate Said’s charisma, which is, unexpectedly, not an entirely positive word. The real drama follows the talk: questions, answers, and debate. Alwan’s space is limited, so come early and ready to rumble. Has civilization invented anything better than the booktalk-in-a-bar. The booze had been poured freely by the time Matthew and I took the stage. The assembled writers, poets, critics, DJs, regulars, students, and passers-by seemed to think it was the most natural thing in the world. Nobody blinked as we abandoned all profundities and slammed ahead with our dramatic enactments of Edward Said’s zanier tough-man contests with hecklers. Attention was paid it seems because, after the events, two friends stepped forward with great suggestions. One: in future, we might enhance performativity by having audience throw papier-mache rocks when we project the scandal-making Said rock-thrower photograph. Two: we might encourage members of the audience to heckle us when we re-enact the Said-shuts-down-hecklers episodes. We are considering whether these improvements can be carried off in soberer surrounds like the upcoming talks at Book Culture (11 May) and ALWAN for the ARTS (19 May).